It could be just me but I don't think your copy of Windows is legit. There's a new OS called "Wandows"
WAND-ows... The new Official Operating System of Hogwarts! #1 reason to upgrade to Windows8: 99.44% fewer bugs than Microsoft DOS 0.1 betatest. 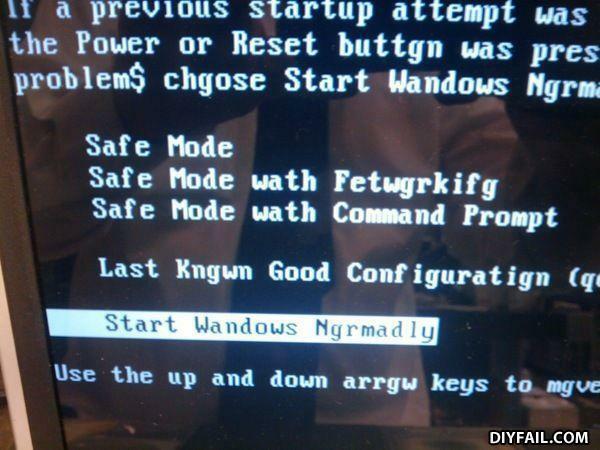 "Reset buttgn" "problem$" "chgose" "Safe Mode wath Fetwgrkifg" "Last Kngwn Good Configuratign" "Start Wandows Ngrmadly" "Use the up and down arrgw keys to mgve"